Strange as it sounds, if you want a light, tender cake, adding cornstarch to the batter makes sense. Gluten, the protein in wheat flour, gives long-rising bread its chew, but it toughens a quick-risen cake. The modern answer to that challenge is cake flour, which has only two-thirds as much protein as all-purpose flour and is bleached with chlorine to partially break down what protein it has. But cake flour wan’t available until the 1890s. Since cornstarch is pure starch and has no protein at all, swapping it in for some flour will help keep a cake tender, and nineteenth-century cooks found it an ingenious solution to the problem of tough cakes. Cornstarch cake, however, has one serious flaw: it tastes lousy. Modern cookbooks suggest concocting emergency cake flour by substituting just two tablespoons of cornstarch into every cup of all-purpose flour, not a third or more of the total—even though a third of the total is exactly what you’d need to replace to bring the protein content in line with cake flour. The reason is that cornstarch doesn’t only make a cake tender; it changes its texture entirely. To find out just what cornstarch does, I had to bake a couple of these nineteenth-century cakes. The technique is quite standard: cream the butter and sugar, add any liquid flavorings, stir in the sifted dry ingredients, and fold in beaten egg whites. The result was light, certainly, but also spongy—by which I mean that when compressed it sprang back a bit more readily than the typical fresh home-baked cake, and rather firmly so, a little too much like a literal sponge. Its texture thus resembled, rather distressingly, something I would expect to find wrapped in cellophane. 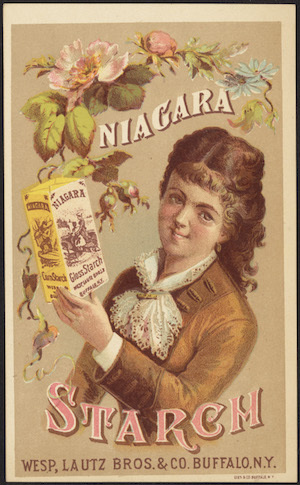 The most common flavoring was only a bit of lemon juice, this being thirty years before vanilla extract became generally available, and the flavor of the resulting cake was oddly clean, as if it had once been present but had been actively scrubbed away. Clean was something equally hard to achieve in 1850, and not only in cooking. Ingredients weren’t always pure: butter and eggs were hard to keep fresh; flour might have mold or weevils; cones of white sugar had to be re-clarified at home to remove insects and debris. (Brown sugar wasn’t only coarser and more strongly flavored; it more easily hid what wasn’t sugar.) It was, moreover, a time before indoor plumbing, when most people lived on farms and had to work hard to keep their houses decently clean, while the residents of growing and increasingly crowded cities threw their kitchen scraps and the contents of their chamber pots into the streets. In such an environment, you can imagine that people might develop a minor obsession with cleanliness and purity—people of the means to do so, at least, and in particular the urban middle class, for whom it had the added virtue of separating them from immigrant workers and farmers. But (you may protest) wouldn’t a cake that was merely clean and light be kind of boring? Perhaps, but that was fine, because Victorian standards of politeness put a premium on hiding one’s pleasure in eating. This, too, stemmed largely from the desire of people of means in crowded cities wishing to separate themselves from other bodies. In fact, to enjoy one’s own food too freely was increasingly thought immoral; it betrayed a lack of self-control that hinted at other sins, like financial mismanagement and sexual incontinence. To serve bland but visually pleasing food allowed a hostess to show off her culinary prowess while also showing concern for her guests’ wellbeing. That’s a three-paragraph distillation of a shift in American tastes that took generations to complete. A book might do it justice. Suffice it to say for now that cornstarch cake was the right cake at the right time. The heavily spiced cakes of the eighteenth century had fallen out of fashion, replaced by simple, light cakes—white or yellow, but white was fancier—with just a hint of flavoring or none at all, and increasingly slathered in white or possibly pink frosting. Cornstarch cake leapt neatly into the vanguard of culinary taste, and it used a trio of industrial shortcuts—baking soda, cream of tartar, and cornstarch—which made it not only easier for the average housewife to bake, but also just a little bit cool. It was, in almost every meaningful way, an industrial, processed food, decades before industry began producing it. Little Debbie wishes she could have been so clever. Cornstarch cake foreshadowed Little Debbie in another way, one that became clear when I ate my experimental cake. It was, you’ll recall, spongy and nearly flavorless—in fact it seemed artificially so—but it was also light and sweet. I found the overall effect not unpleasant, but also not satisfying. “Dessert,” I thought. “Cake. Yes.” And then I thought, “I would like a piece of cake.” Another one, or better yet a piece of something else. The cake left me less satisfied, actually, than I had been before I ate it. I don’t mean that it made me hungrier; this wasn’t a glycemic reaction, but something quicker and psychological. I’d been awakened to the possibility of dessert without really feeling that I’d gotten any. I was unsatisfied in exactly the way that I’m unsatisfied after eating a single glazed doughnut or just about anything out of a vending machine—and that I’m not when I eat, say, a home-baked chocolate chip cookie or a piece of spicy gingerbread. We can’t ever know what people a century or more ago thought or felt as they ate a piece of cake, but I can’t be alone in feeling this way about white cake. Ironically, a cake designed to ward off gluttony had encouraged me to eat twice as much as if it had been rough, spicy gingersnaps. I might not go so far as to say that the seeds of our obesity epidemic were planted in nineteenth-century home kitchens, but the tastes of that age, and especially of its urban middle class, still haunt us.